Silverfish - When describing this insect, they are described as“bristletails” even though there is no specific insect that is a “bristletail”. 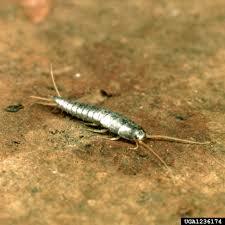 The silverfish has silvery scales that rub off easily when touched or moved, thus causing a dirty smeared look on walls. the temperature to go over 90 degrees, and they prefer moist and humid areas like kitchens, bathrooms, crawl spaces and damp basements and attics. They are active at night and prefer tight places to hide. Their diet consists of debris found in cracks and crevices, behind moulding and baseboards, and behind furniture.